Hello, I am Chris M., author and developer of The Austringer Website and falconer. 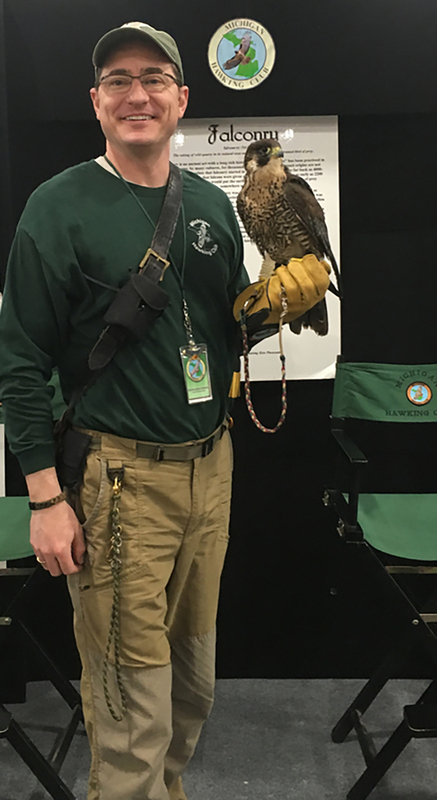 I am a Master Class Falconer and I am currently hunting with my 2x Intermewed Passage Peregrine Falcon, Sabre. I look forward to continuing my falconry adventures and hunting sessions this fall/winter with Sabre. Who knows what the future may bring, as much of this sport happens to me as much as I give my best efforts to the falconry life. I have been reading, studying, training, hunting, and collecting as much knowledge as I can about the sport of falconry. I truly enjoy working with wild birds, especially raptors. I have a terrific sponsor and many other supportive falconers in the Michigan Hawking Club who are committed to teaching the sport of falconry at the highest level possible. This website opens up a creative and passionate outlet for my love of raptors and falconry, as I have been studying birds and raptors since I was 10 years old. When I am not working on some aspect of falconry, or hawk club work, a father of two boys, a test automation engineer, web developer, iOS Developer, trout fisherman, and all around outdoorsman. The website will be dedicated to my experiences as a Falconer/Austringer, from student to master and beyond. It will contain regular updates of my personal experiences, falconry projects, trapping, equipment creation, training, hunting expeditions, as well as interviews and opinions of other falconers. I hope to share my findings, crafts, enjoyment, and love for raptors with others through this site in the hope that it will help others in their pursuit of their passion. This will also serve as a record, diary, and sharing experience as I journey along the path of Falconry and being a Falconer / Austringer. It is also my hope to meet other great falconers who wish to share their experiences along their journey as well. Please feel free to leave comments on the articles and pages! I encourage interaction and dialog between falconers in order to learn more about the sport and improve understanding of our craft.